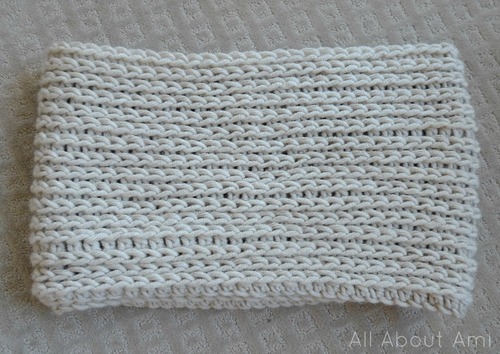 When I first made these “15 Min Coffee Sleeves” last Christmas as quick gifts (see HERE), I fell in love with the look of these stitches as I did not know that this “knitted v” look could be achieved through crochet! I told myself that I would design a cowl with this look the following fall/winter, and here we are today! 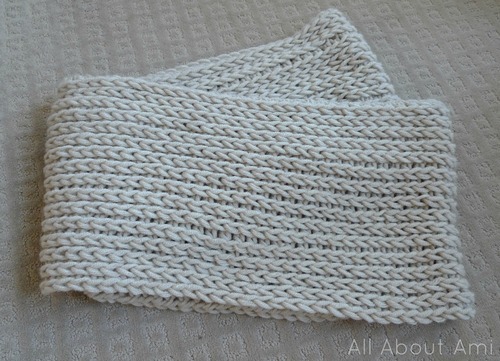 This technique creates a very dense and solid piece, so I knew that I wanted to work with a lighter, softer yarn in order to counteract this or else the finished cowl would be too heavy and thick. 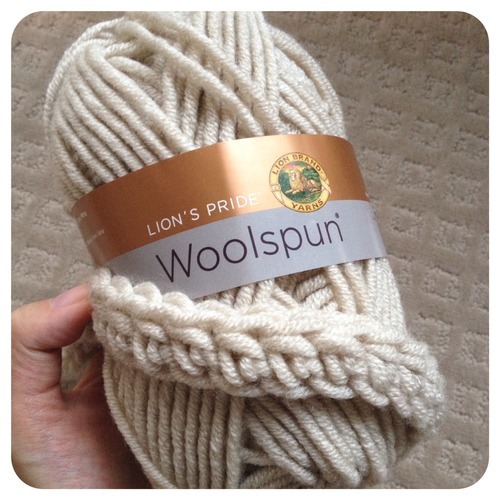 As I browsed around Michaels to look for the perfect yarn, I came upon the new “Woolspun” by Lion Brand Yarn. I was immediately drawn in by the beautiful colours available, and when I felt the yarn itself, it had a “bounce” to it and was incredibly soft. If you’re someone who is sensitive to “scratchy” yarns, I highly recommend checking out Woolspun as it is very soft without a hint of scratchiness. I picked up 1 ball in “Linen” to test my design/pattern out with this yarn and then ended up going back to buy 2 more later on (thus I used 3 balls in total). 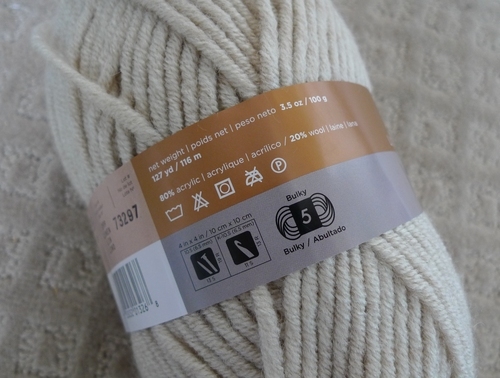 “Woolspun” is a bulky (level 5) yarn that is 80% acrylic and 20% wool. I know that many of you have worked with this yarn already and have nothing but good things to say about it as well! 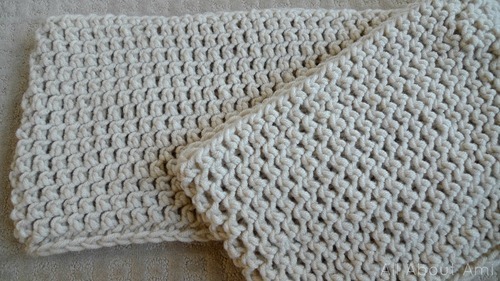 Pieces made with this yarn drape beautifully (cowls, sweaters, hats) and are so soft and cozy! I wanted this cowl to be very long so that I could loop it twice around my neck. Thus, I chained 120 to begin with. 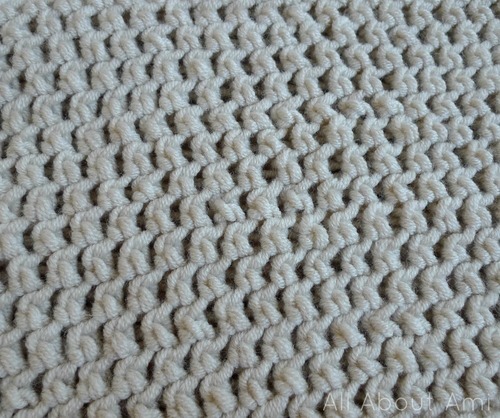 Even though the recommended hook size is a 6.5 mm with this yarn, I used my very large 10 mm hook so that the stitches would be bigger and to achieve a more open, airy look and feel to it (and to counteract the denseness mentioned above). Just be careful where you are inserting your crochet hook when working through this pattern as you do not want to split the yarn! This cowl is worked in the round (not row by row and seamed up at the end) so I needed to slip stitch to the first chain being careful not to twist the chain. Next I chained 2 and then worked my first half double crochet in the same chain as where I did my Chain 2. Then I simply worked half double crochets all the way around. After Round 1 of half double crochets was complete! 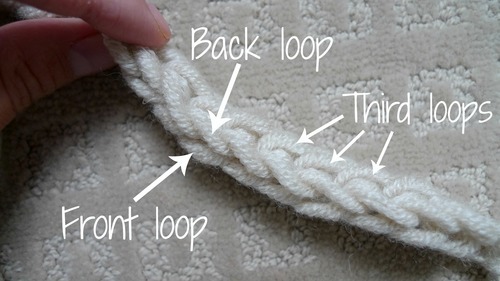 When you look at the V-stitches and loops you have just created, you will see front loops (the ones closer to you) and back loops (the ones further away from you). 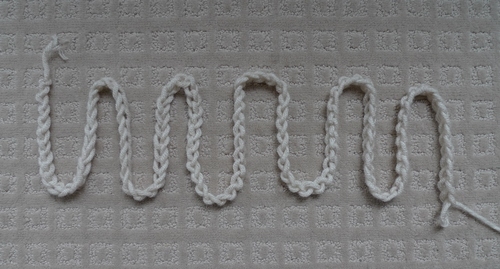 A special third loop is created when you work with half double crochets. When you tilt your piece towards you, you will see the third loops visible behind the back loops. This is where you will be working your half double crochets from now on! Check out this helpful blog post and video by Moogly HERE if you would like additional support on how to locate the third loop! I wanted to use up as much of my 3 balls of Woolspun as possible, and I was able to crochet 16 rounds with very little yarn left over! For reference, you can crochet about 5 rounds per ball of yarn in case you want to use fewer or more balls of Woolspun. Isn’t the finished piece absolutely gorgeous? 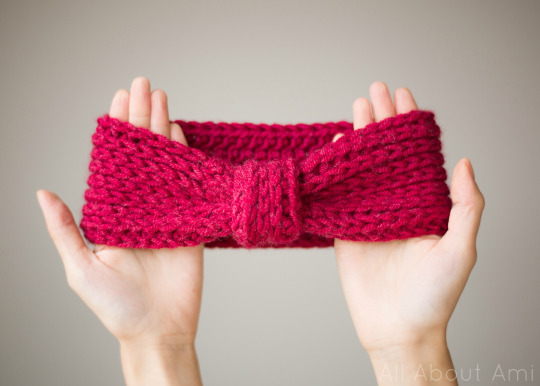 I adore the look of the V’s, and it is so simple since no seaming or assembly is required at the end! It really has an elegant knitted look to it! 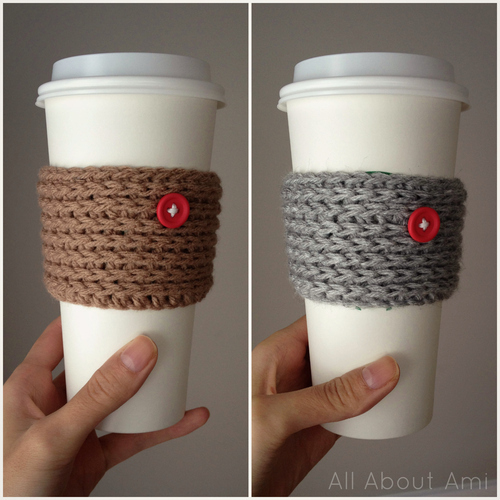 From this angle, it looks like a giant coffee sleeve like the ones I crocheted last Christmas! Glad I could finally use this technique to design a cowl after being inspired by it last year! This cowl drapes and folds beautifully! Do you notice the unique-looking stitches that are visible on the other side of the cowl? They look like this! If you were to show me these stitches a while ago, I would definitely have a hard time identifying what these were! They look very different but also have a pretty texture and look to them. 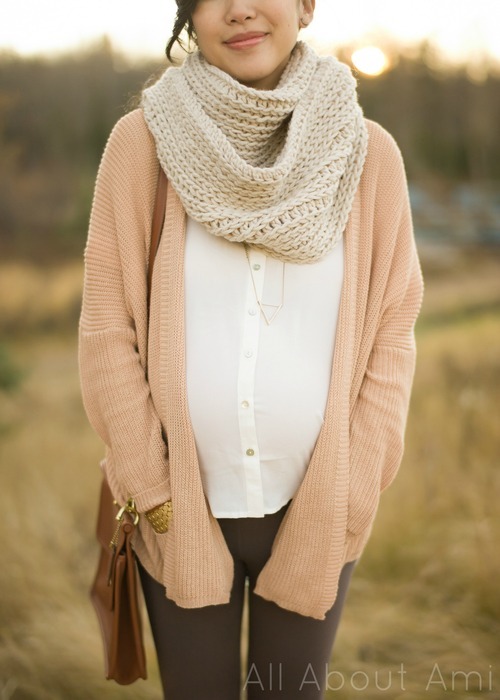 You could wear your cowl with this side facing outwards too for a completely different look than the “V’s”! 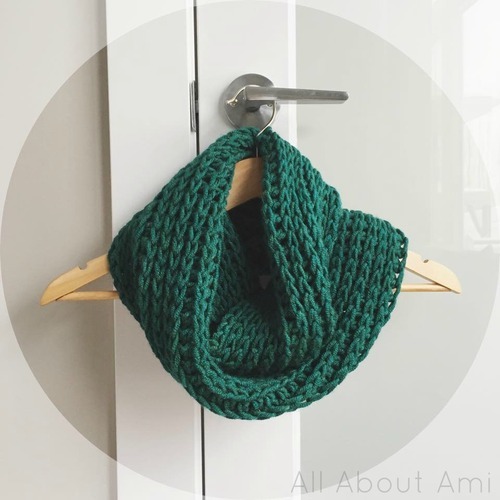 I was having a hard time trying to figure out a name for this cowl, so I reached out to my readers on Facebook, Instagram and Twitter to ask for help! 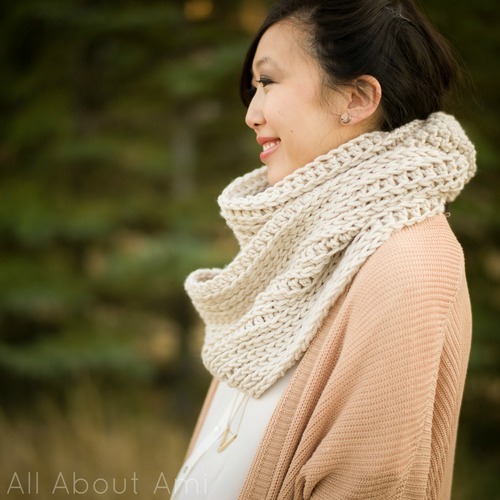 It was fun hearing everyone’s suggestions, but when Krista of “Sewitpretty1” on Instagram suggested the “Triple Luxe Cowl”, it seemed like the perfect fit! “Luxe“ by definition means “luxurious, expensive, high quality” and this cowl fits the bill with its luxurious look and feel to it. 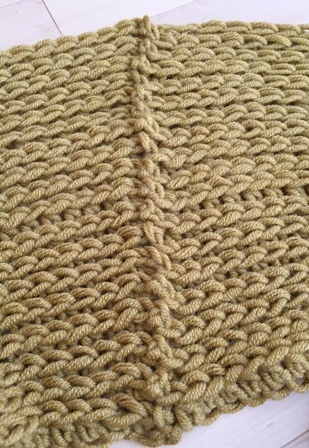 I think it looks like a cowl you could find in a high end boutique or on the runways! 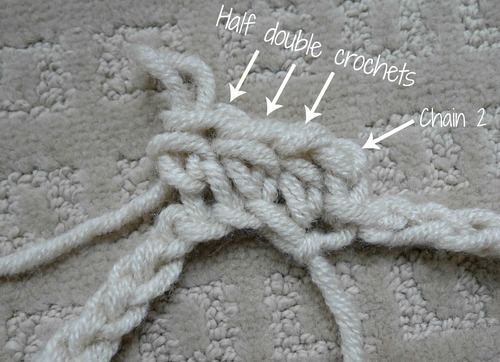 The “triple” is fitting as well since all the half double crochets are worked in the third loop. Thanks for your brilliant suggestion, Krista! 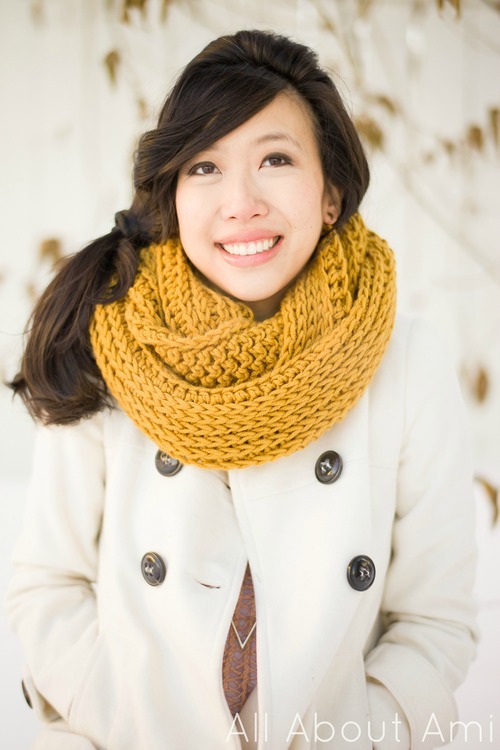 Here is the official pattern for my “Triple Luxe Cowl”! Chain 120. 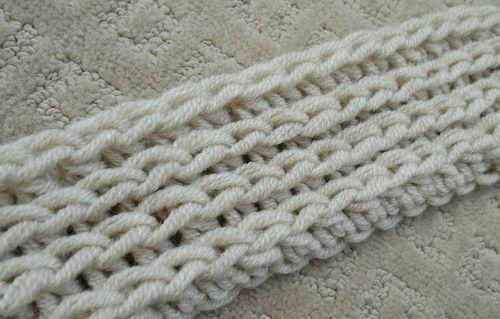 Join with slip stitch to first chain, being careful not to twist the chain. Round 1: Chain 2. 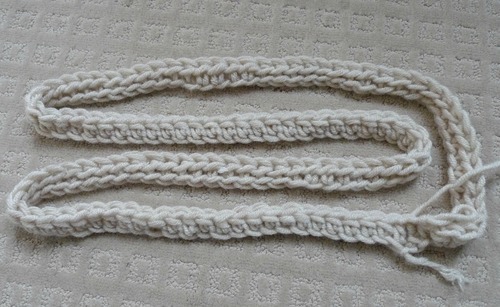 Half double crochet in same stitch as chain 2 and in each chain around. 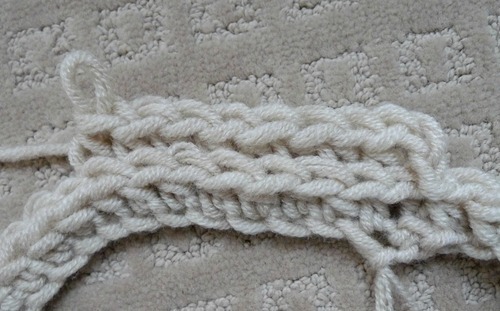 Slip stitch to first hdc [not to Ch 2] (120 hdc). Round 2: Ch 2. 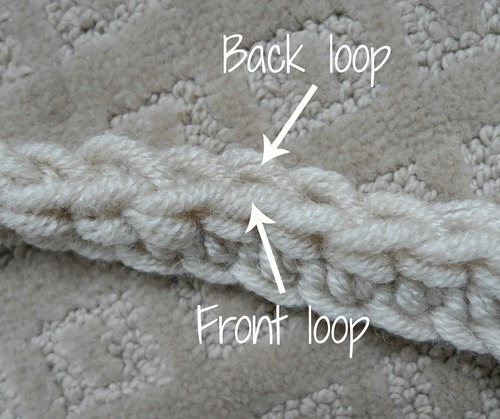 Hdc in third loop of same stitch where Ch 2 was worked and in each third loop around. Sl st to third loop of first hdc (120 hdc). Round 3-16: Repeat Round 2. My finished piece measured 9″ or 22.5 cm wide and 32.5″ or 83 cm long. Note: The seam should be going straight upwards and not slanting to the side (see pic below). If you do not like the look of this seam since it’s not invisible, you could simply work in unjoined, continuous rounds (no slip stitch or chain 2) in one big spiral. If you use this spiral method, you will be left with a jagged top since you are not closing your rounds. 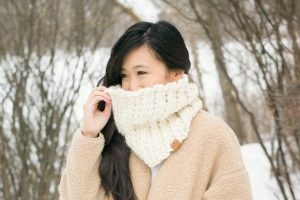 To minimize this jagged top, you can work a single crochet and then a slip stitch after the last half double crochet to make it a more gradual decrease! I cannot emphasize enough how beautifully this cowl drapes and hangs! Sometimes I find that I tend to overheat when wearing very thick cowls indoors, but this cowl is very breathable since Woolspun is so soft and since I used such a large crochet hook. The result is very airy and light! 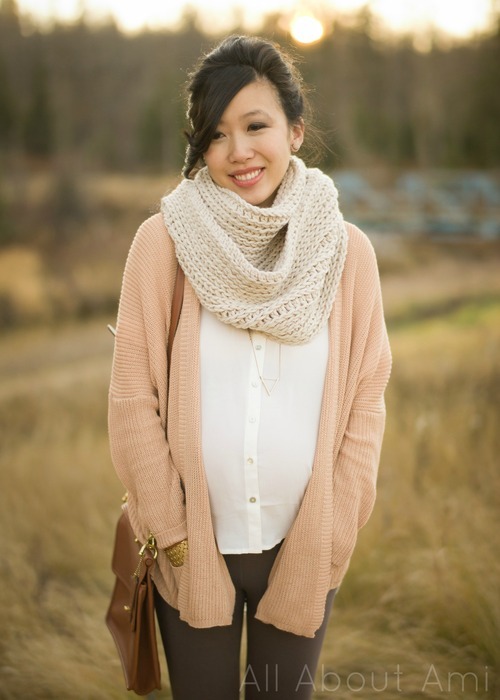 I adore this neutral linen colour since it matches all my sweaters and jackets! I’m also tempted to make another one of these “Triple Luxe Cowls” in perhaps a golden yellow or chartreuse green (check out the full range of Woolspun colours available HERE). 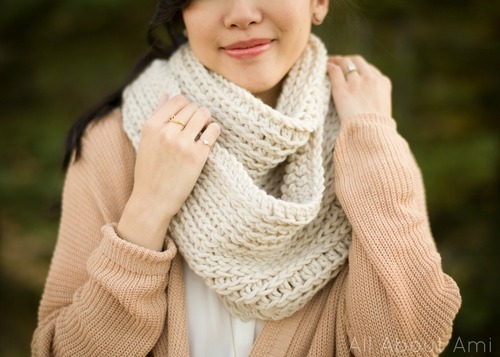 If you want your cowl to be fitted more closely to your neck with less draping, you could do fewer initial chains (e.g. Ch 100 or 110 instead of 120). 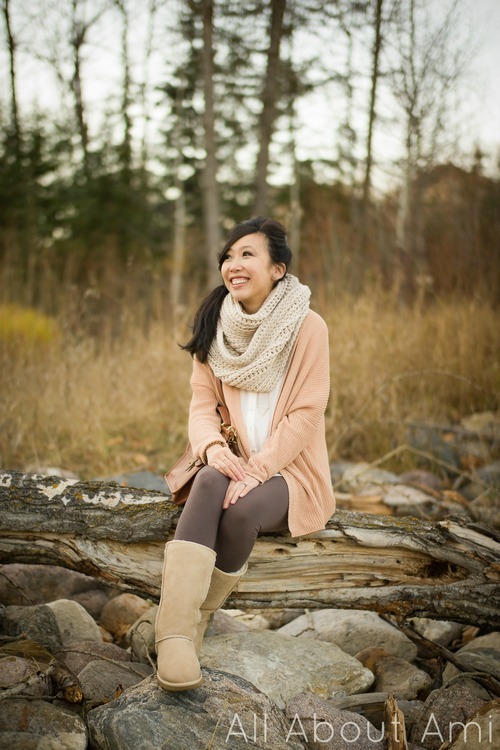 I have fun styling my outfits to showcase my crocheted designs as I get to combine my love of fashion and crochet! I think that taupes, browns, pinks, greys and golds make such a pretty and elegant colour palette! Just look at those bouncy, soft layers and folds! 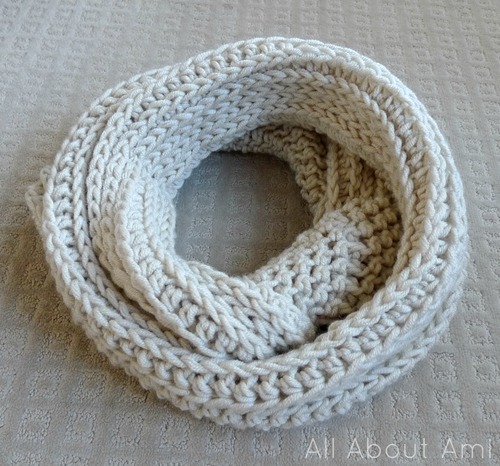 Andrea on Facebook suggested the “Marshmallow Cowl” for a possible name which I thought was really cute too- it definitely is pillow soft, smooth and bouncy like a marshmallow! We got our first major dump of snow this past weekend and it looks like it’s here to stay. 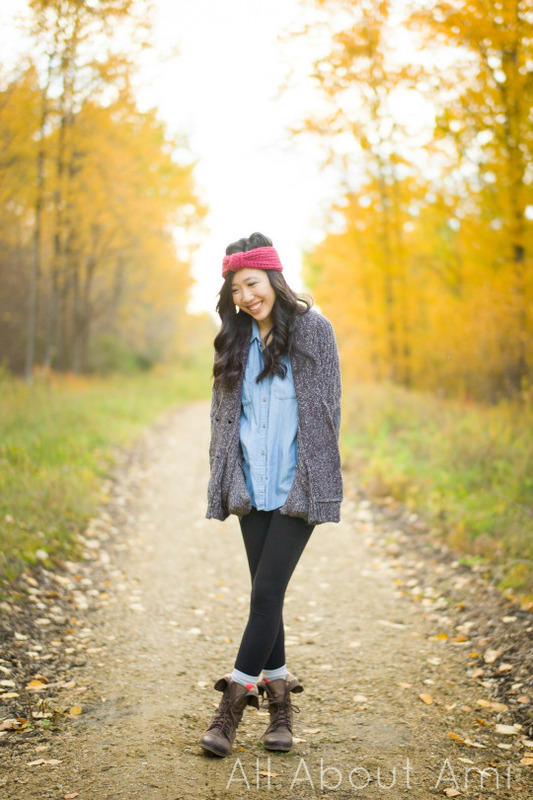 This was probably my last non-snow photoshoot of the year! The next project I blog about will be set in a winter wonderland! – Using 3 balls of “Woolspun” in “Honey”: Chain 110 in the beginning and do 18 rounds to get a cowl that hangs closer to your neck. See more pics HERE. – Using 2 balls of “Woolspun” in “Peacock”: Chain 95 in the beginning and do 14 rounds.